About two weeks ago we participated in the Baystate Bridal Expo at the Hynnes Convention Center in Boston. 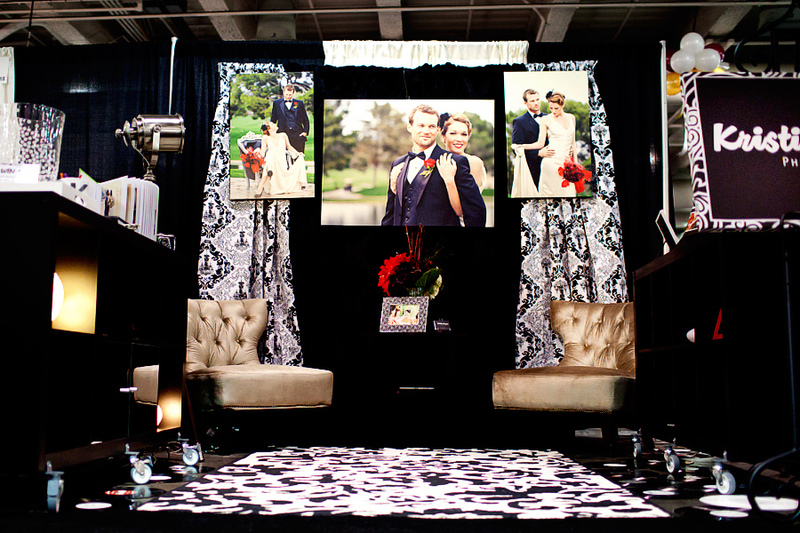 This was our first bridal expo or bridal show and we were a little bit nervous going into it. To sum things up, it was a great experience! Many business cards were handed out (we had an array to choose from including some cool cards that I designed through Moo) and we look forward to talking to the awesome people we met. We held a drawing in which the winner receives an engagement shoot. I admit we have been holding off on pulling the winning ticket, but we plan on doing that this weekend and are totally pumped to do an engagement shoot for one lucky couple (which I will be sure to announce on the blog). So again, for all you brides to be, nice meeting you! 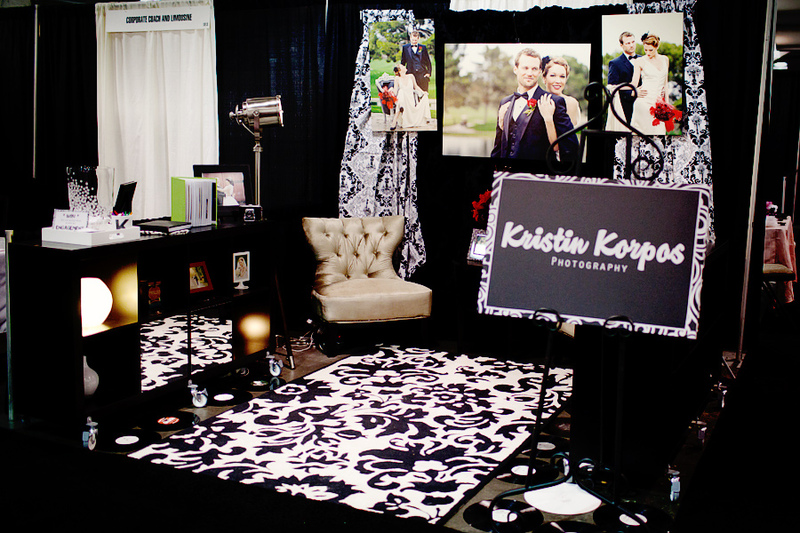 And for all my current clients and fellow photographer friends, please feast your eyes on the booth we worked so hard to create! Ah, I should note that the floral arrangement on the table between the chairs is from Winston’s Flowers on Newbury Street. 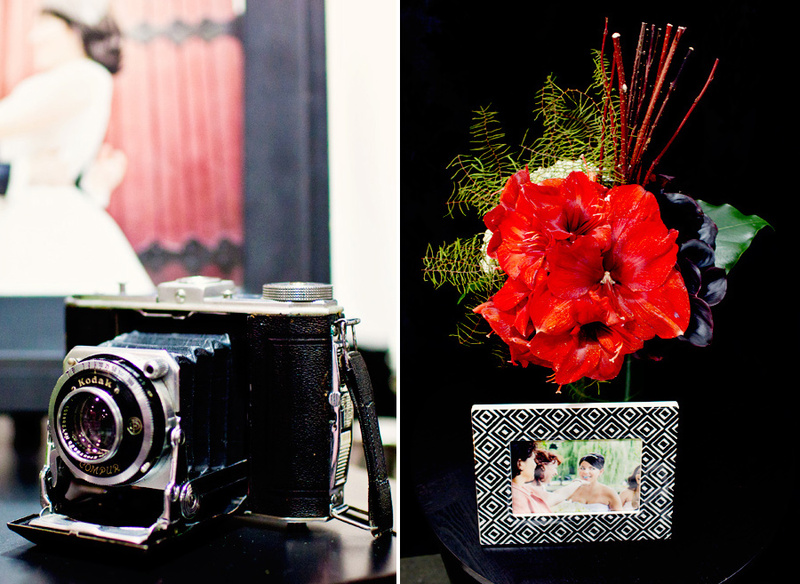 They did an awesome job creating this edgy, but vintage array of flowers. And a shout out to the cool peeps I met including another florist, ‘flou(-e)r who had some amazing arrangements and the best smelling booth at the expo! Shang - Gorgeous! I’m sure your hard work will pay off! kristin - Thanks a bunch for the nice compliments! Kim - I know I tweeted you back on this but I just had to comment again here that this looks amazing and SO unique! I love everything about it! kristin - Thanks for the blog love and the nice compliment Kim! Melissa - Love love love those chairs!!!! kristin - Chairs are from Home Goods – you can find some great stuff in that store! I can’t wait to use them in some photo shoots!